Raiders star played better than a 4-12 record, becoming just the third quarterback in franchise history to throw for 4,000 yards in a season. KANSAS CITY — It was a difficult question to answer in the moment — hey, you get whacked 35-3 and discovering many positives becomes more taxing than covering Tyreek Hill in space — but Derek Carr managed to see a flicker of light in the canyon of darkness that was a 4-12 season. The 16-game schedule that seemed like 26 at times mercifully ended for the Raiders on Sunday, officially bid adieu with a blowout loss to AFC West champion Kansas City before 77,550 at Arrowhead Stadium. It’s a point most who follow the Raiders have waited for, a chance to actually look forward, to bury this first season under Jon Gruden in his head-coaching return beneath a landfill of defeat and despondency. How a few of his more controversial moves — trading the team’s best player in edge rusher Khalil Mack to Chicago and wide receiver Amari Cooper to Dallas — are graded for the Raiders won’t be known until the draft is completed and first-round choices are made and those names transition into the NFL. It could be years, really, before we know how foolish — or, well, savvy the trades were. But at this point, given the Bears and Cowboys are bound for the playoffs and those draft picks are suddenly much lower than Gruden hoped for when making the deals, the foolish side of the ledger has a solid lead. No matter what new faces the Raiders add via the draft or free agency, awaiting them will be a quarterback who became just the third in franchise history to throw for 4,000 yards in a season, who went 332 passing attempts without an interception before having the streak snapped Sunday, who was sacked 51 times over those 16 games when playing behind a young and injured and makeshift line. Who, while some surmised might also be traded during the season, wasn’t sure who many of the skill players around him would be week to week. The Raiders won three of their final seven games after starting 1-8, and such improvement on the scoreboard coincided with Carr becoming more and more comfortable with all Gruden demanded. Carr, who joined Rich Gannon (2002) and Carson Palmer (2012) as those Raiders to reach the 4,000-yard mark, improved as the season wore on. He played better than 4-12, despite now being 0-5 in games at Arrowhead Stadium with a 61.9 quarterback rating in those defeats. “New system, young tackles, inside three guards all gone, receivers coming and going, new featured running back (in Doug Martin),” said Gruden. “I thought (Carr) did some really good things to build upon. We have to get better around him. I have to get better myself. 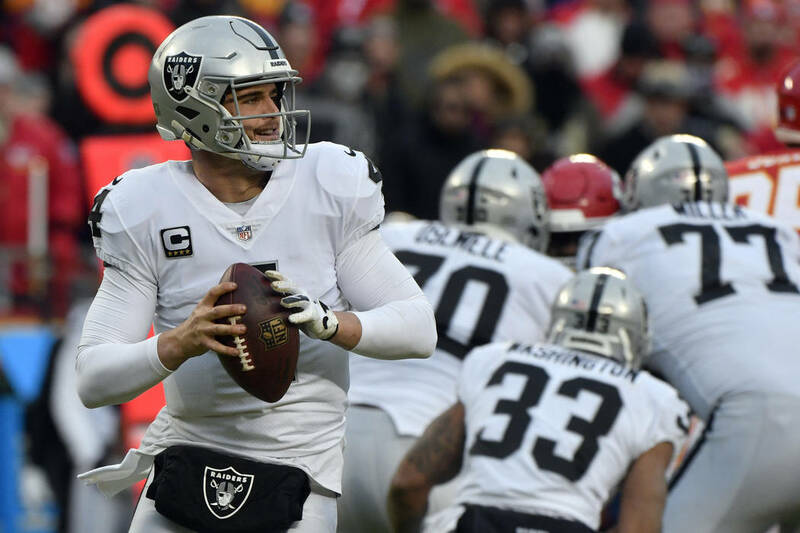 It would help if the Raiders re-signed tight end Jared Cook who, despite a mental gaffe Sunday that led to a 54-yard interception return for a touchdown by the Chiefs, was the team’s leading receiver and has become Carr’s most dependable option. It would really help if left tackle Kolton Miller finally gets healthy and uses the ups and downs of his rookie season to return a far more consistent player. Help is needed pretty much everywhere. 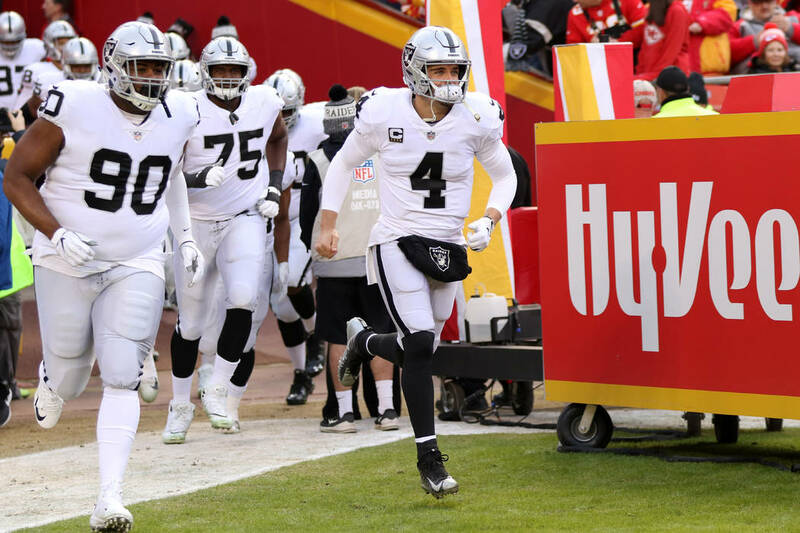 “Absolutely, 100 percent, it was the (hardest season of his career), from the standpoint of all the things we had to deal with,” said Carr, who finished with 4,049 passing yards and will be entering his sixth season in 2019. “Losing some friends, people getting hurt, playing with some news guys off the street. It was tough. All that means is they haven’t done it yet. Whether they will any time soon is tough to gauge after 4-12.